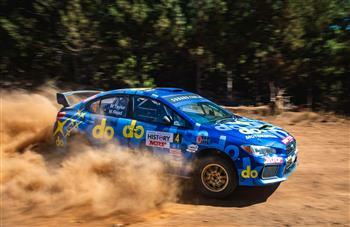 Action then returned this morning to the eight longer forest stages outside Nannup, including two challenging runs through the rally's longest stages, SS15 and SS18 Range 1 and 2. Third place on the morning's first stage, SS12 Brockman 1, was an indicator of Subaru do's serious intentions. SS13 Folly 2 saw contender Tom Wilde's WRX STI lose around four minutes due to a tyre change, giving Taylor an opportunity to pounce and seize second place overall, going into service, ahead of the three remaining morning stages. A decision during the morning to again increase the starting gap between cars from two minutes to three, due to heavy dust, prompted cancellation of the day's final stage, SS19 Galena – organisers deemed the rally would have finished too late in the afternoon. Molly said: "It's been a challenging day, but ultimately rewarding to achieve points after battling through the last four stages. "We certainly proved to ourselves in the first three morning stages that our pace is up there, and our confidence in the new car is growing with every kilometre. "But the electrical problem on SS15 set us back and we were glad to make it through to lunchtime service. "All in all, it's been a good start to the season and we feel that this package is going to be really capable based on our early experience."